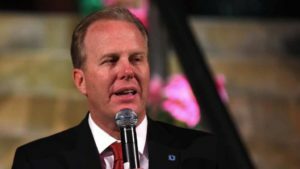 Facing lukewarm support for his plan for a November special election on expanding the San Diego Convention Center and renovating the Qualcomm Stadium property, Mayor Kevin Faulconer Thursday called on the City Council to keep $5 million in election funding in the budget for the fiscal year that begins July 1. The City Council could vote on adopting the $3.6 billion spending plan at Monday’s meeting and can still make some adjustments. Concentrating on the convention center and homelessness in a series of media interviews, the mayor said his plan to hike the hotel room tax would raise money to pay for expansion and fund homeless programs and street repairs. At a City Council meeting last week, some members of the panel and the public questioned spending $5 million on a special election during a tight budget year. They also said a special election this year would violate the spirit of a voter-approved City Charter amendment that places ballot measures in regularly scheduled general elections. The mayor said he was concerned about their comments. His plan would raise the levy on hotel room bills by 1, 2 or 3 percent, based on proximity to the convention center — those closest would pay the most. About two-thirds of the new revenue would go toward the building project. Homeless services and road repairs would evenly split the rest. Tourism leaders contend expansion is needed because San Diego is losing the largest trade shows to other cities, while competing localities have for years tried to lure Comic-Con International out of town. Meanwhile, the number of people living in the streets in downtown and elsewhere has ballooned in recent years. This week, Councilmen David Alvarez and Chris Ward expressed their opposition to holding a November special election in opinion pieces on the Voice of San Diego website. Alvarez cited last year’s Measure L, which directed ballot measures to general elections except for emergency situations. Ward said he supports the convention center expansion project but has noted growing community opposition that might make it impossible to reach the two-thirds needed to pass a tax increase. At the meeting, Councilwoman Georgette Gomez said every member of the panel could find better ways to spend $5 million. Barbara Bry, who chairs the council’s Budget Committee, said she supports expansion, but opposes a special election this year. She also wrote on Voice of San Diego that she opposes a special election for the proposed SoccerCity project in Mission Valley. In speaking to the media, Faulconer said delaying the convention center vote for one year would cost the city $75 million, including $43 million in construction cost increases. He first signaled his intention to get the long-stalled expansion project off the blocks at his “State of the City” address in January. Expansion was approved six years ago, but has been stalled by litigation over environmental and funding issues. The hotel room tax is currently 10.5 percent citywide, with an additional 2 percent fee that funds tourism promotions. Bob McElroy of the Alpha Project — which serves the homeless community — said the mayor’s plan would provide the first dedicated funding stream for his and other programs. Federal and state funding priorities change over time, often stalling initiatives just as they’re beginning to make an impact, he said. A member of the SoccerCity development team also met with the media to support the special election. The group contends that a one-year delay would thwart the will of tens of thousands of San Diegans who signed their initiative petitions, and potentially cost them a Major League Soccer expansion franchise.